Sold out! Wait list being taken! 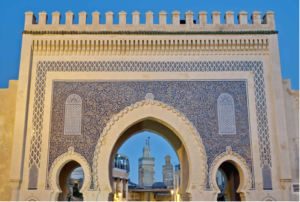 Join Colleen on this remarkable 10-day journey through Morocco, considered the 'Jewel of North Africa'. Colourful and lively, this richly diverse country is populated with warm hospitable people with a passionate love of music, art, and sublime food. A long history of social traditions, a reputation for religious and ethnic tolerance and the longest running monarchy in the world all contribute to the fabric of this modern-day magical kingdom. Amongst many other exclusive agenda points, be mesmerized by the sunrise over the dunes, enjoy a camel back ride in the desert, experience the maze-like streets in the Medina of Marrakech, and explore a number of incredible UNESCO World Heritage Sites. Your journey through this fascinating land is a feast of sensory and cultural delights. We hope you can join us! Price per person land only $4,599 based on two sharing and a minimum of 10 passengers. (Limited to a maximum of 12) Not included: personal expenses, airfare and taxes, meals not specified, tipping. Single supplement $999. Private transfers are available at an additional cost for those not arriving at the same time as the group. Hold your space with a $600 non-refundable deposit.